Split zoning technology is a primary source of year-round comfort control worldwide. Mitsubishi has been available in the U.S. for almost 30 years, but is increasing in popularity because it provides comfort and is efficient. 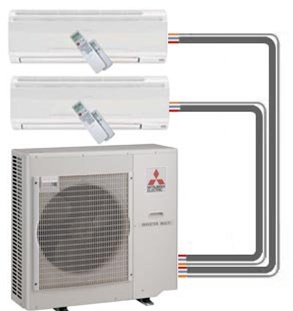 Mitsubishi Electric’s split zoning systems use refrigerant lines to connect an outdoor unit to one or multiple indoor air handlers, increasing the energy efficiency within a home. Advanced technologies are used to help you precisely control the temperature of each room that has an indoor unit and allows you to condition only the rooms in use. Using a wireless remote or wall-mounted controller for each space, your Mitsubishi Electric system allows a truly personal level of comfort control. Environmentally friendly refrigerants, advanced filtration systems and high SEER ratings come standard on the full product line. This synergy of application, technique and advanced technology delivers true eco-comfort for your home or work space. Find out today if a Minisplit System might be right for you!